NJDEP has been active in 2017 on the air front, and we’ll likely see some of NJDEP’s initiatives carry over into 2018. On the permitting front, NJDEP has recently announced several new general permits: GP-016A, which covers minor source manufacturing and material handling equipment with potential emissions below reporting thresholds, is intended to constitute a more flexible and workable replacement for existing general permits governing abrasive blasting, woodworking and small emitters; GP-018 and general operating permit GOP-008 for boiler(s) or heater(s) with a rated capacity greater than or equal to 5 MMBtu/hr and less than 10 MMBTU/hr, are intended to replace the current general permit for boiler(s) or heater(s) each less than 10 MMBTU/hr. Additional general permit actions are anticipated to include revisions to general permits governing fuel dispensing facilities, portable equipment, boilers and heaters with a rated capacity equal to or greater than 10 MMBtu/hr and less than 50 MMBtu/hr and non-MACT plating operations. Several rulemaking actions have been completed, including the recently published rules that adopt federal VOC control technique guidelines for paper, film and foil coatings, fiberglass boat manufacturing materials, miscellaneous metal and plastic parts coatings, and industrial cleaning solvents, as well as NOx RACT standards governing existing simple cycle combustion turbines combusting natural gas and compressing gaseous fuel at major NOx facilities and from stationary reciprocating engines combusting natural gas and compressing gaseous fuel at major NOx facilities. 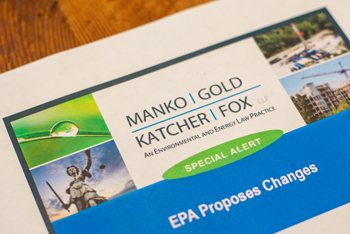 A rule addressing federal PM2.5 New Source Review permitting requirements and the removal of certain startup, shutdown and malfunction provisions was recently finalized, as was a rule repealing t-butyl acetate (TBAC) reporting requirements and addressing the decommissioning of Stage II vapor control systems. NJDEP’s Resiliency, Air Toxics and Exemptions (RATE) rulemaking was proposed for public comment, and was adopted in final on January 16, 2018. The RATE rulemaking is intended to: 1) incorporate resiliency measures regarding the use of emergency equipment conducting construction, repair and maintenance; 2) update toxic valuations using current scientifically based values; 3) incorporate new permit exemptions for specified equipment and operations; 4) repeal Subchapters 30 and 31 (pertaining to outdated NOx trading programs); and 5) undertake minor cleanup of existing rules. In light of the RATE rule’s proposed tightening of reporting thresholds for a large number of hazardous air pollutants, this rule has potentially significant ramifications for many facilities in New Jersey. NJDEP has also announced new developments in the world of modeling and risk assessments. Certain changes to its risk screening worksheet have been made, including the addition of sulfuryl fluoride as a pollutant for which risk screening must be conducted and the adoption of California’s risk factor for those assessments. N-Propyl Bromide is also being considered for inclusion, while the unit risk factor for ethylene oxide has changed from 8.8E-5 per µg/m³ to 3E-3per µg/m³ and the unit risk factor for trichloroethylene has changed from 2E-6 per µg/m³ to 4.8E-6 per µg/m³. Reference concentrations for several pollutants, including benzene and trichloroethylene, have also been changed. A description of all the recent changes can be found here. NJDEP has also announced impending revisions to Technical Manuals 1002 and 1003, governing the preparation of protocols and procedures for air modeling and risk assessment protocols. These revisions are being developed in conjunction with a small, invitation-only group of stakeholders and will be subject to public comment prior to finalization. And, the new administration can be expected to move forward aggressively to reinstate and possibly develop new greenhouse gas initiatives. All this and more in 2018!